The Business Clinic: at the heart of the curriculum, replacing the traditional marketing dissertation with a collaboration between students, business, other organisations and academics to produce real solutions and new perspectives that are underpinned by rigorous theory and research. Pictured, LtoR: AM Chair Anne Marie Doherty and Award recipient Nigel Coates. Creative academic teaching for Marketing students: benefits from using colour, music and rewards. Pictured, LtoR: AM Chair Anne Marie Doherty, Award recipient Elena Chatzopoulou and AMEDUC Chair Lynn Vos. This year 1 Team and 2 Individual Awards were made. Team – Sukhbinder Barn & Mark McPherson (Team: Middlesex University Residential Field Trip), Middlesex University; Residential Marketing Fieldtrips: Adding value to post graduate education through experiential learning. The Academy of Marketing is delighted to announce the winner of the 2015 AM Individual Teaching Excellence Award.The Award was presented at the Academy of Marketing Conference in Limerick in July by Lynn Vos, Chair of the AM Education Sub-Committee. 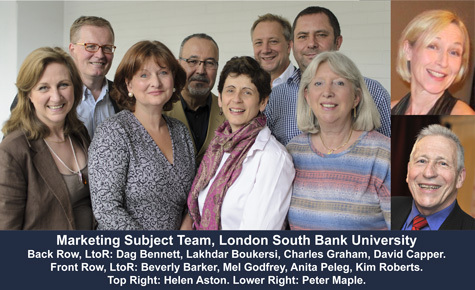 The Academy of Marketing is delighted to announce the winners of the 2014 AM Teaching Excellence Awards.The Awards were presented at the Academy of Marketing Conference in Bournemouth in July by Lynn Vos, Chair of the AM Education Sub-Committee.